When we arrived in Alleppey, India, we were bombarded with offers to board a houseboat for a night or two. That’s what tourists do in Alleppey: cruise the backwaters on a private boat. But after arriving here, we were just not impressed by them. The houseboats have a bedroom, kitchen and outdoor sitting area, and the price is inclusive of meals. You essentially never need to step off the boat, which was one of the reasons we decided against staying on one. We aren’t traveling around the world to distance ourselves from locals – we want to interact with them. 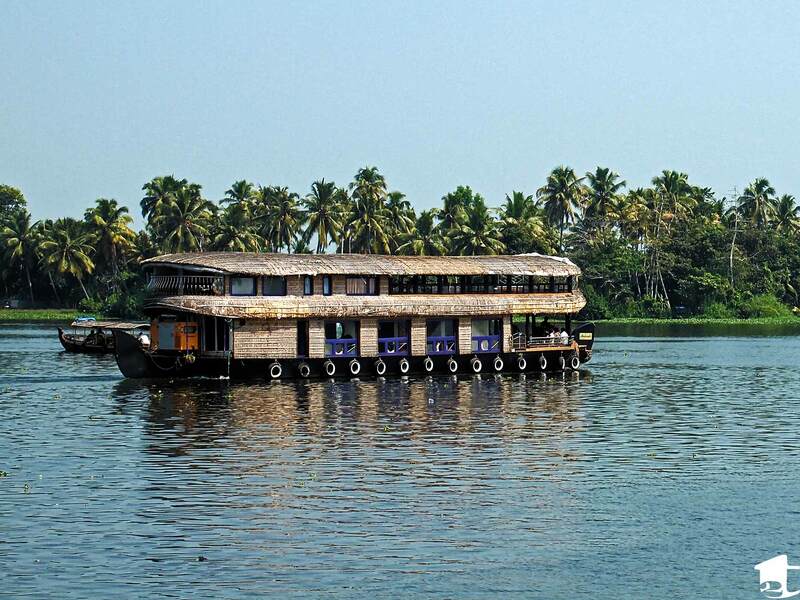 A Kerala backwater houseboat, locally called a kettuvallam. But you certainly can’t come to Alleppey without seeing the backwaters, so at the suggestion of a local, we jumped on board the public ferry. A roundtrip cruise through the larger backwater channels took two and a half hours. It was a great way to view the beautiful landscape and watch village life unfold as we pulled over to pick up passengers at various ferry stops. But as we cruised along the larger waterways with other ferries and houseboats, we noticed small canals branching off. It reminded us of walking through a medina in Morocco: Maybe there is a main market street, but most of the local treasures are hidden along the snaking alleyways. Our curiosity led us to discover Kerala Kayaking, which is the only company in Alleppey offering the opportunity to kayak through the narrow canals that don’t allow larger vessels. After one too many lazy days on our homestay’s hammock, we were pretty stoked about the idea of mixing exercise with adventure. Even though we were waking up before sunrise in Africa, we are still not big fans of early mornings. But by taking the morning tour, we were able to see more activity in the villages and did not have to worry much about the blazing sun. And – here’s the no-brainer – a traditional Kerala breakfast was included. At 6:30am, we watched the sun rise over palm trees and rice paddy fields. An Alleppey sunrise is not to be missed. The sun is a brilliant and deep orange, the temperature is cooler and the mosquitos disappear. At 7am, Binu, a local and the owner of Kerala Kayaking, docked a shikara at our homestay to pick us up. We jumped on, kayaks in tow, and went across the waterway to a village restaurant for a traditional breakfast of egg curry with puttu and masala chai. Mike with the local fish eagle. As we were waiting for our meal, we spotted two fish eagles hanging out in the rafters above us. Binu smiled and asked if we wanted a closer look. Turns out they hang around the restaurant as “pets.” (The locals feed them the occasional fish and the eagles come and go as they please.) One of the locals called to the eagle like a domesticated bird and extended his arm for the fish eagle to hop up. He then placed the eagle on our arms and shoulders so we could get a closer look and take photos. It was awesome, and what a beautiful bird! Back at breakfast, Binu showed us the proper way to eat Kerala-style: Spoon some curry onto the puttu, then, with your right hand, mash the puttu so it becomes soft enough to ball up. Scoop it and eat. (Be sure not to eat with your left hand, as it is considered unclean.) After we finished the curry, we repeated the same procedure with a banana and the puttu. YUM! We left our belongings on the shikara and placed our camera into a waterproof bag Binu provided. Now we were ready for adventure! We paddled tandem down waterways that were as narrow as the length of the kayak. The village was alive on either side of us. Kids were running off to school, bicycles sped down dirt pathways and women washed clothes or containers in the canal. Everyone was so friendly that we had to juggle between paddling forward and going hands-free to wave and say hi. Every now and then, Binu would stop his kayak and explain various things, like the commerce going on around us. We passed some locals in canoes that are meat wallahs, bringing mutton or chicken to hard-to-reach backwater villages. These sellers come by on specific days and times so the locals don’t have to trek into town. We also passed a canoe selling pillows and mattresses, a floating dispensary and another with treated drinking water. For us, people so accustomed to big businesses and cookie-cutter housing communities, it was a treat to witness how well the locals and government work together to support village life. Straining palm toddy at Toddy Shop 95. Earlier that morning, we mentioned to Binu our desire to try palm toddy, so he made a village toddy shop our last stop of the trip. We first heard of toddy in Africa and have been trying to find it for a few months, so this was a very special way to end our morning. Binu let Reji, our shikara driver and a toddy expert, go first to ensure it was high quality. Then he called us into a hut that was subdivided into smaller rooms where you can enjoy a glass of toddy. Toddy is a delicate liquid. It is extracted from palm trees each morning (each tree can deliver approximately 5 liters per day!) and ferments so quickly that it must be drank that day. So the later in the day you go, the higher the alcohol content. The good thing is that you’re always guaranteed fresh toddy in the villages. Binu warned that the “palm toddy” sold in the main town is neither tasty nor authentic, as it is usually an artificially made mixture intended to get one drunk. It is difficult to describe the taste. It is as though coconut water and yeast had a carbonated baby. But the smell is, well, awful. We’re happy to report that it didn’t blind us and is something we wouldn’t mind having again. We took a direct public bus from Ernakulam (take a ferry there from Kochi) to Alleppey town. It takes approximately 1.5 hours, depending on traffic. Cost: 44 rupees per person, one way. Pay cash on board. You can also take a train or private auto. There are homestays galore in Alleppey as low as 500 rupees per room. 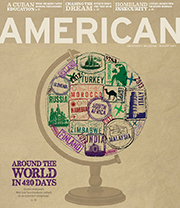 We recommend a homestay versus a hotel. Try to book one on the water for great daily scenery. Find a local village toddy shop to try the best and freshest toddy. Locals told us that from 5-6pm is the optimum time to enjoy a well-fermented glass. The public ferry departs from the canal next to Boat Jetty Road. Take boat no. S41 or S42, a double-decker. Cost: 50 rupees roundtrip per person. Pay cash on board. Kerala Kayaking offers affordable daily kayaking trips through the backwaters that run either 4, 7 or 10 hours, as well as multiday tour packages. Email Binu for rates, and don’t forget to tell him that Mike and Tara sent you! Disclosure: We received a tour discount from Kerala Kayaking in exchange for sharing our experience. As always, all thoughts and opinions are entirely our own. Binu is a great guide and we would absolutely recommend this tour and do it again! This entry was posted in Destinations and tagged adventure, Alappuzha, Alleppey, backwaters, bucket list, expenses, India, kayaking, Kerala, Kerala Kayaking, narratives, nature, rtw, travel. Bookmark the permalink. Excellent post! I love the idea of the kayaking. If we are ever in India we will do this. Yes, we highly recommend it!